Dragons! Fire breathing, empire-crushing dragons are the scourge of dwarf, elf, and man alike. As expires battle for supremacy and ancient enemies act out centuries old blood feuds, the dreaded dragons descend. 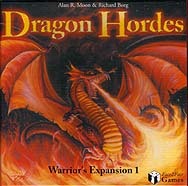 With Dragon Hordes, the first expansion set for Warriors, you can change the balance of power forever. Crush your enemies and torch their battle lines, but beware - they may also know a few of the foul wyrms. Dragon Hordes is not a stand-alone game. It is a supplement to the basic Warriors game.